Comments: The 131.671 mph lap record breaking "angry" lap that pushed Guy Martin off the podium. Comments: Practice week is almost complete, but this was the first dry timed session after bad weather had caused severe disruption. Bad practice, good race as they say, and luckily it was, with almost a full nine days of unbroken sunshine. Comments: Everyone has there own little idea of "TT nirvana." 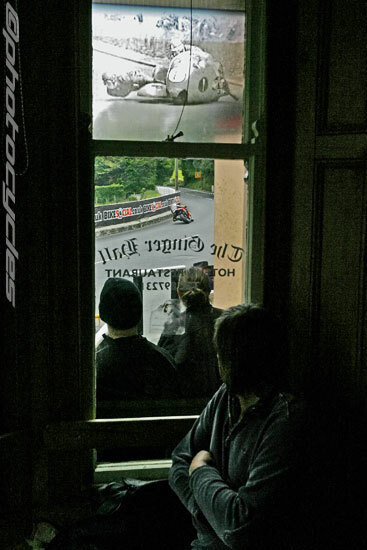 Some like to sit inches from the action, others just want to soak up the bonhomie from an on-course boozer. Comments: This is one of those right time right place shots that you might be fortunate enough to see once every few years. Arriving late as usual, the remote camera's took an age to set up, leaving no time to get to my preferred hand held camera position before heads turned in anticipation of the first bike on the road being gunned out of Ballaugh village. I ran to join the large crowd on the entrance to the ultra fast right hander. It was fast, it was Michael - at maybe 150+ mph, knee slider inches from the high kerb, on a braver tighter apex to anyone else that day, the Legends Fireblade kicking up a rooster tail of dust and gravel in it's wake. Flip !! 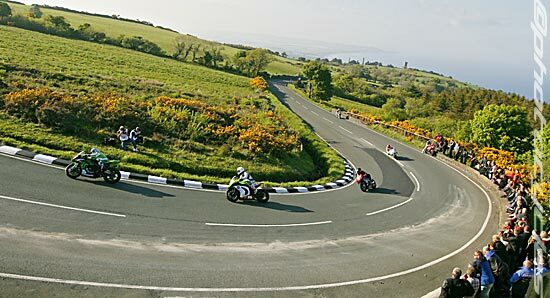 ( not what I said, but there might be children reading ) - In 30 years of TT snapping I've never seen riding like that, even 2 hard nosed seen it all before local TT spectators I was stood next too cheered at the spectacle, it was that impressive. Something similar had happened at Glen Helen last year when Michael had sent grass flying skyward. 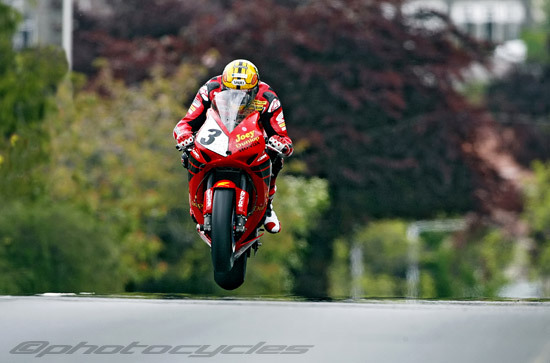 Michael is developing his very own 21st Century "Dunlop style" that even had John Mcguinness admitting Michael "was taking the TT to a new level"
Comments: This guy was told repeatedly by the marshals to stop doing this with the camera phone, and for what?, another blurry crap clip on the internet? What if next year spectators are banned from harmlessly sitting on the bus shelter because one or two idiots like this dropped a phone into the road? The TT is dangerous enough without this carry on, don't abuse the freedom we still enjoy - EVERYONE has to think of how they're own actions might effect others. Comments: Brookes never seemed to let the surrounding hype affect him, just kept his head down, learning the 38 miles at his own pace. That pace amounted to nearly a 115mph lap in the first practice session, the quickest first session speed to date. In Josh's first race the 6 lap Superbike he upped Steve Plater's 2007 fastest TT debut lap to an amazing 127.726 mph, looking super smooth not using any where near the full road. 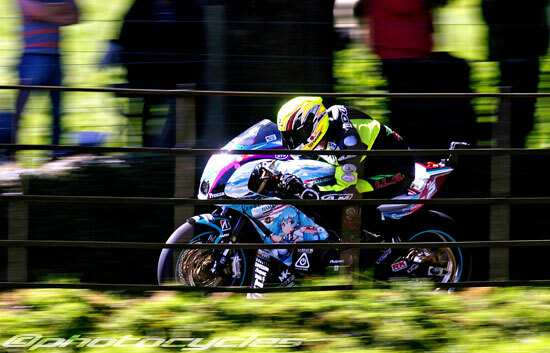 Comments: Ian Lougher took over his great friend Yoshinari Matsushita's ride on the Komatti KM1 for Wednesdays TT Zero Race. He called time on his incredible 30 year TT career after Matsu's death in practice week was " the final straw. " 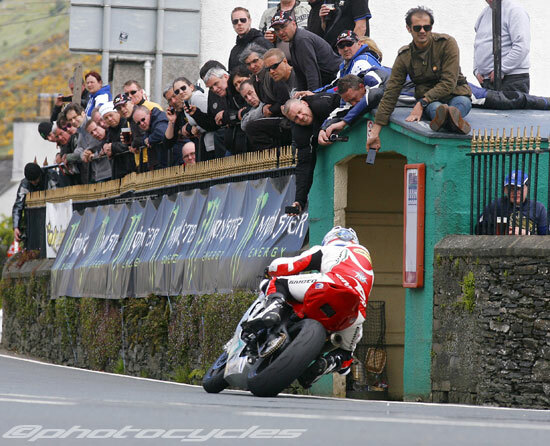 Comments: Michael's victory in the Superbike TT came a year earlier than many pundits had expected, baring breakdowns, John Mcguinness had never been beaten on the Superbikes in 10 years. 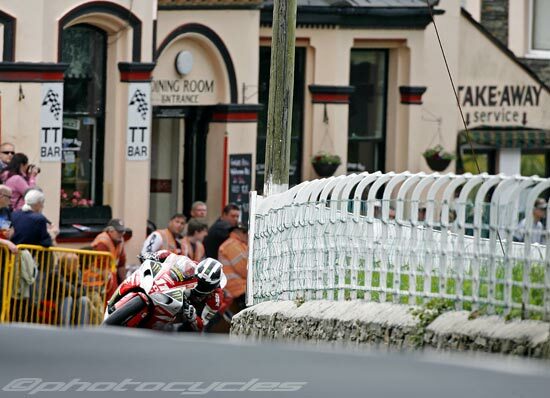 Looking back this landmark win really started during last winter - after being drafted into the Honda Legends team for the 3 main road races, Michael went into rigorous training to lose over 19kg in weight. Cameron Donald unexpectedly stepped down from the Legends endurance squad, then Rutter was injured, Michael got the call up for Magny-Cours in France. The amount of track time racked up during multiple 2 hour racing shifts can't be under estimated in Michael's new found TT dominance. In his debut in the W.E.C. at Bol d'Or, Dunlop, not a noted short circuit scratcher, really gave notice of intent by setting the team's fastest qualifying lap. 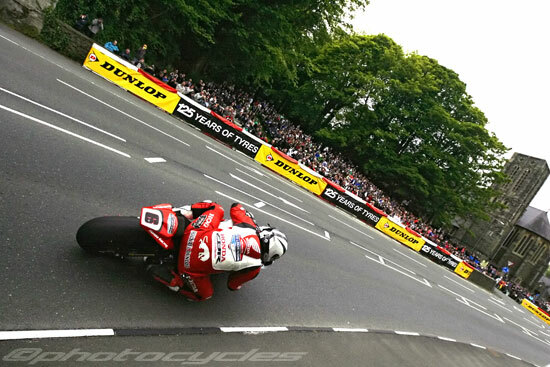 2013 will be remembered as a stand-out year - the TT's up and coming next generation starring Michael Dunlop, James Hillier and the Birchall brothers fought wheel to wheel with the established "old" guard of Mcguinness, Anstey, Donald and Molyneux. Then there was Josh Brookes, the highest profile newcomer since Pat Hennen in 1977. The laid back Australian British Superbike star ezceeded everone elses's expectations by finishing 10th in the Superbike race, even if the new fastest ever TT newcomer chooses never to return he'll be long remembered. After a mixed early practice week of weather with a canceled Tuesday night session the action never really got started untill Thursday. Clerk of the Course, Gary Thompson, played another masterstroke by bumping racing back by a day, making Saturdays traditional first race day a glorious 7 hour sun drenched practice session.